Hi, today is the release of the new Altenew Watercolour 36 Half Pan set among other watercolour supplies. I know a lot have you have long been awaiting this release! I have a video review of the half pan set that I filmed earlier in the year, and I’m so glad that production has now been sorted to allow this release to go ahead. Today’s post is part of a blog hop, and I’ll have more details of that below. I’ve linked all supplies at the end of this post. Compensated affiliate links used. 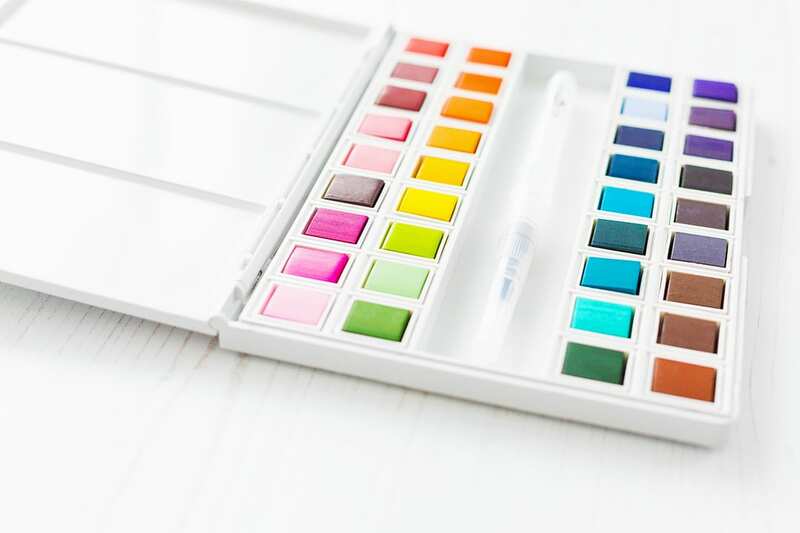 “This beautiful set of 36 vibrant watercolor half-pans coordinates perfectly with our line of ink. They are intensely pigmented, fade minimally when drying, and some colors have lovely granulating effects. They are stored in a convenient plastic case, designed with space for your brush (included) and a palette in the lid for mixing. Some of the case lids snap off upon opening and can easily snap back on after you are finished creating so you can store your mixed paints with the rest of the pan colors. For a start, as with everything Altenew produces, great consideration has been given to design and quality of the Watercolour Half Pan set. The watercolours come presented in a lovely box with beautiful illustrations, and there are details on the back of the colours included which align with the Altenew inks. 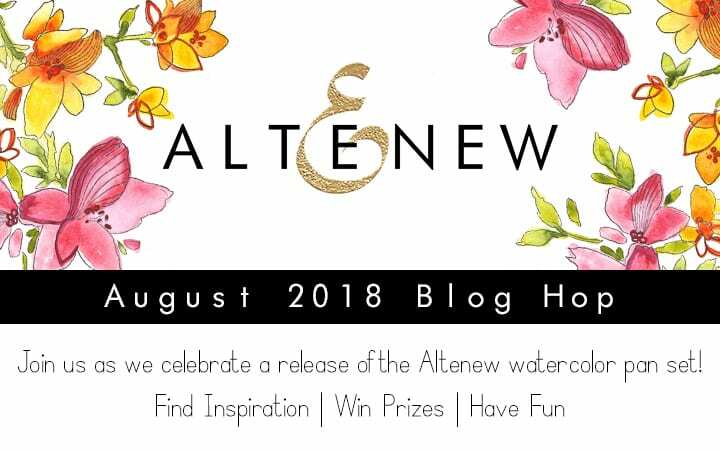 The watercolours are housed in a sturdy white plastic palette with the Altenew logo in gold script font on the front. Each half pan of paint comes in its individual container with the paint name on the underside and fits into its well within the palette. Included with the palette is a waterbrush and there’s space for more brushes if you so wish. I always like to create a swatch for my watercolour palettes, and so I cut a piece of watercolour card sized to fit inside the palette and planned out the rows of colour before swatching each hue. I started on the left of each square with full concentration of paint and then blended out with water to the lightest value on the right. The quality and presentation are spot on, and you have to consider the price point. 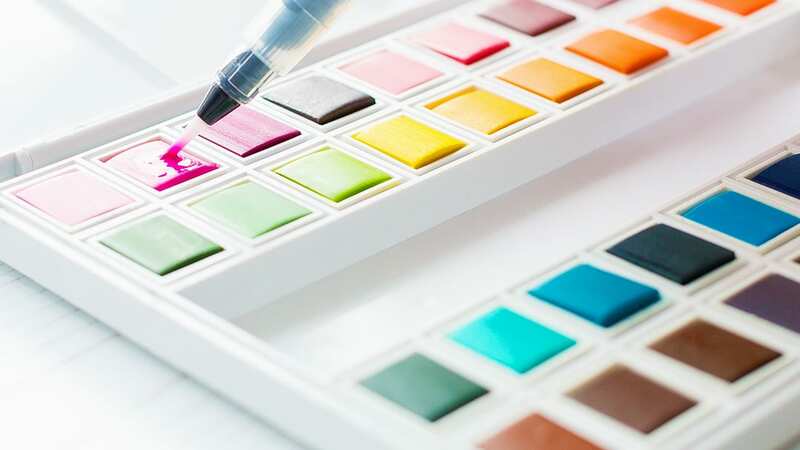 In comparison to the tubes of watercolour which would set you back hundreds of pounds or dollars for 36 paint colours then the Altenew set does bring great value. 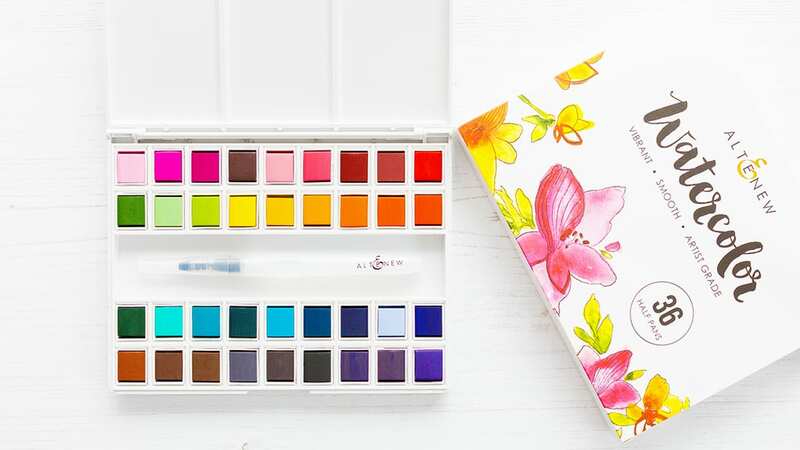 If you haven’t already got a watercolour set, then this one from Altenew is well worth considering especially if you are already a lover of Altenew as it makes the perfect companion to their stamps and inks. 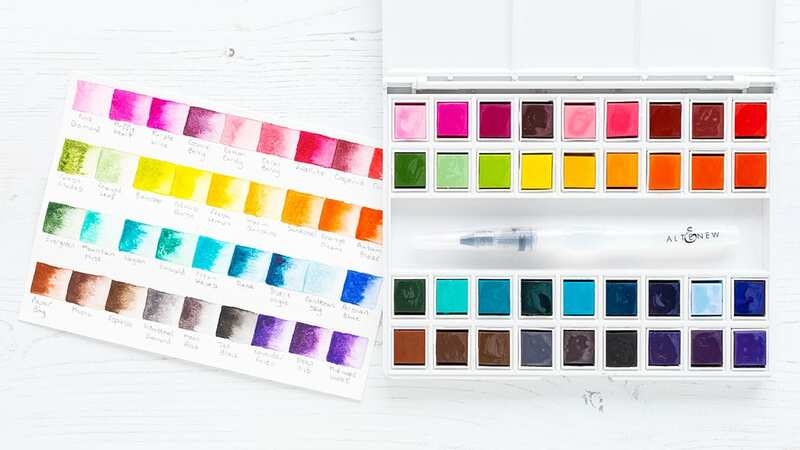 The Pan Case has a great price point, and I could see myself getting one of these to keep my other watercolours in as I love the bright, clean look the white palette has. 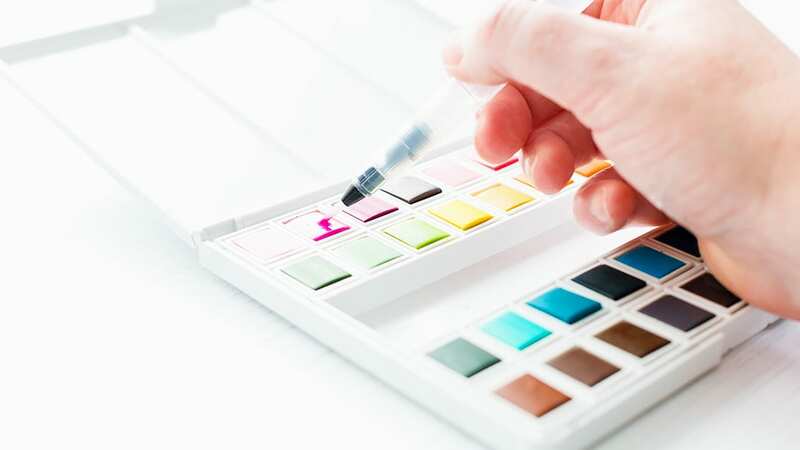 Another product I think I’d find useful is the Watercolor Palette either Medium or Large. I’m often reaching for an old white porcelain dinner plate to give me extra mixing room and one of these palettes would be a much nicer, flatter option. Personally, I’m not a fan of water brushes preferring to use a simple paint brush. 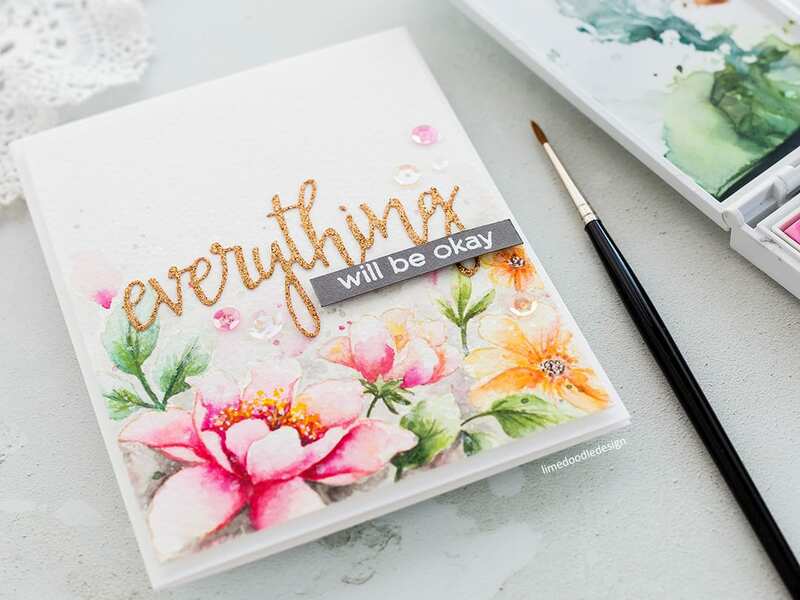 However, I know many people love them, and I think it is good that the waterbrushes come in a range of tips, Small, Medium and Large to cater for the size of the area to be watercoloured. With my paints swatched out, I moved on to see how they performed when painting a floral card. 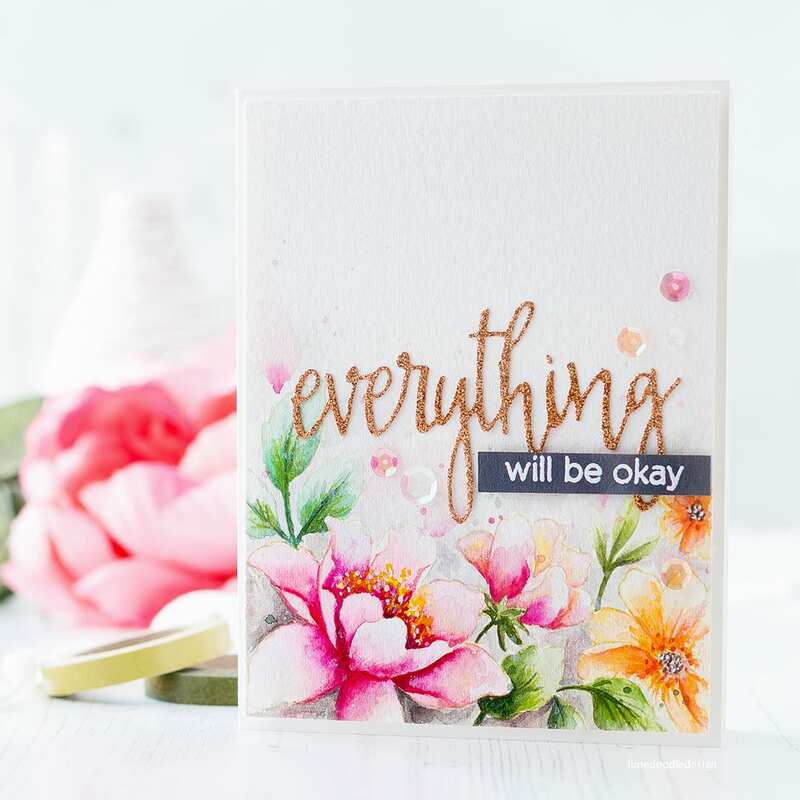 I used a variety of Altenew floral sets to create the scene for this card – Build A Flower Coral Charm, Beautiful Day, Garden Treasure and Peony Bouquet. I stamped a floral border on a piece of Arches Cold Pressed watercolour card with Antique Linen Distress Ink. This water reactive ink will blend and fade with the watercolours to leave a no-line look to the final painting. I didn’t worry too much about masking each element of the scene as the lines aren’t visible by the end. Instead, I just swiped away ink with my finger where I think it would overlap another image. I painted the scene with the Altenew Watercolour 36 Half Pan set, starting with the lightest colours to give a base layer to the flowers and leaves. I generally find it easiest to start with light layers and slowly add depth. 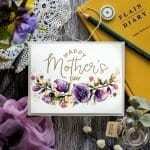 As a card maker who loves to paint flowers, I can see that I will be using a lot of the colours in the palette. I suppose because these watercolours tie in with the Altenew line of inks they are already biased towards a beautiful rainbow of options perfectly suited to painting the flowers that Altenew is so well known for. I finished off the floral border by splattering some of the leftover paint and then my favourite splatter Perfect Pearls solution to give a lovely subtle sparkle to the piece. I trimmed the watercolour piece until it was just slightly smaller than an A2 card base and then I went in with coloured pencil to add definition. I used Faber Castell Polychromos which I prefer for adding these final details as they have a slightly harder lead and so hold their point better and don’t break as easily. I added a few dots of white gel pen to highlight the flower centres and then set this panel aside while I worked on the rest of the card. I cut the Halftone Everything die from some Simon Says Stamp glitter card, and I used one of the coordinating sentiments from the Halftone Everything set and stamped it in clear embossing ink on Slate card. I then sprinkled on white embossing powder and heat set before trimming to a skinny banner. With all the pieces now prepared, it was just a case of putting the card together. I used Ranger Multi Medium Matte to adhere the Everything glitter die cut to the watercoloured panel and then used foam adhesive to mount the accompanying sentiment. I added foam adhesive to the back of the watercoloured panel and adhered it to an Ivory card base and then finally I added a few sequins and held those in place with Ranger Multi Medium Matte. 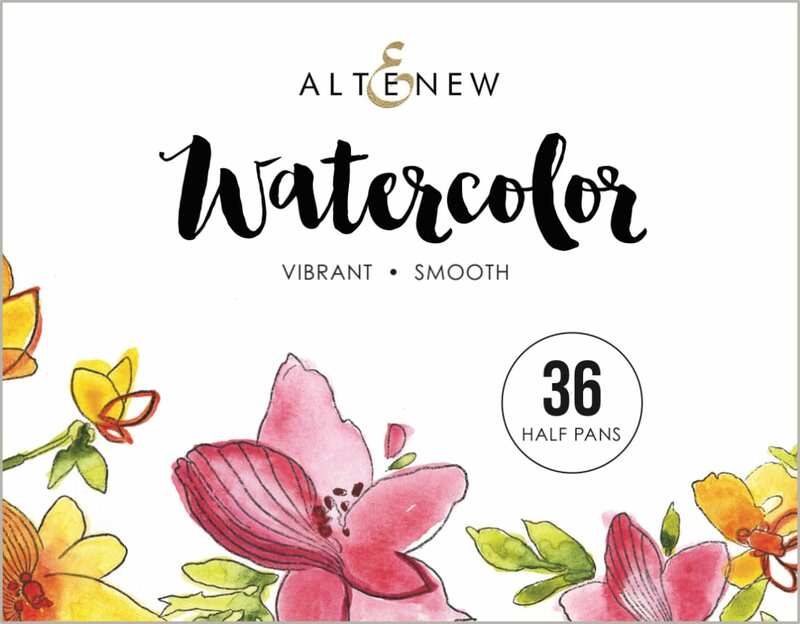 Check out the new Altenew Watercolour 36 Half Pan set here. Also, I have a $30 gift certificate to give away. Leave a comment by 12 August at 11.59 pm EST, and I will announce the winner on 13 August. Beautiful card and gorgeous coloring techniques. 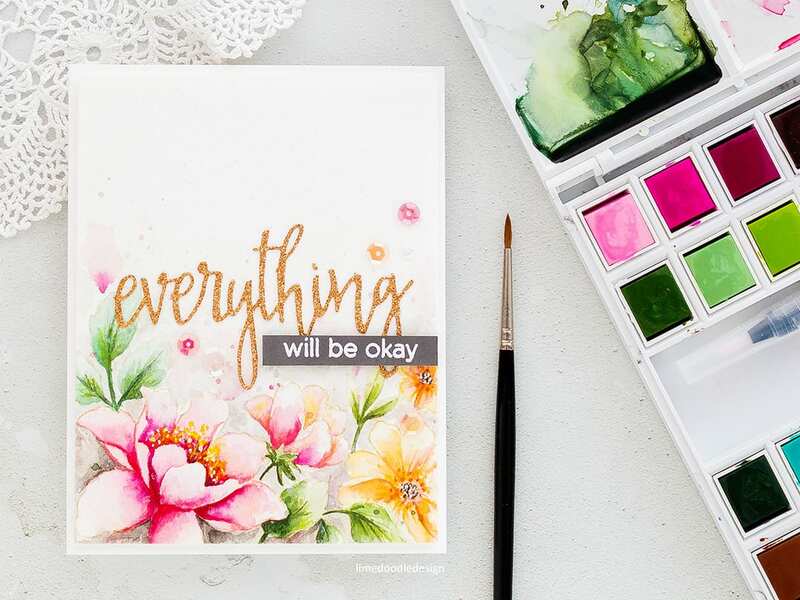 This watercolor set looks fabulous…a definite must have. Thanks! 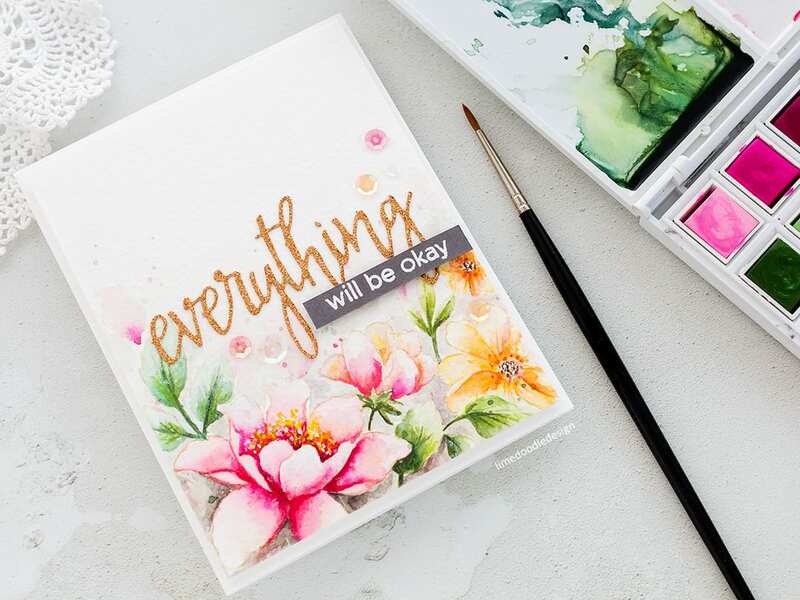 Beautiful card…love the vibrant colors you can get with these watercolors. Gorgeous card and color chart! Can’t wait to try these pretty watercolors!